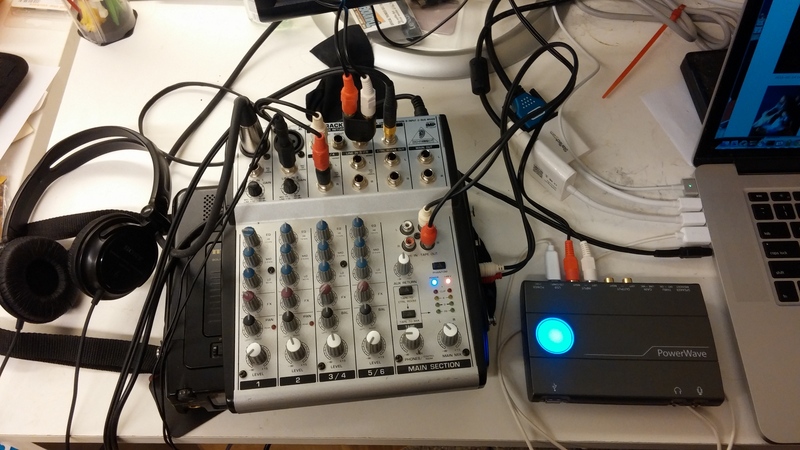 tl;dr – This post is about how I finally got a full setup where I can play arbitrary computer audio into a Google Hangout or other conference; save a copy of the audio to my local media with no repeating; and use a single microphone for all of the above. This information is Mac OS X specific. One of my dirty secrets of my podcast career and earlier is that until recently I had never once recorded a remote interview with my own equipment using a single microphone setup. I have always had two, one that the person on the phone or Skype connection was hearing and then my own local microphone that was recording me. It started as laziness and never was a thing I readdressed until the last few weeks when it became a problem. My Google Hangout with Butler a few weeks ago forced my hand on a lot of this and made me get my act together. Go to your Sound system preferences. You need to set your Input as “Soundflower 2ch” and your Output as “Soundflower 64ch”. I guarantee at times this will seem counterintuitive, just roll with me. 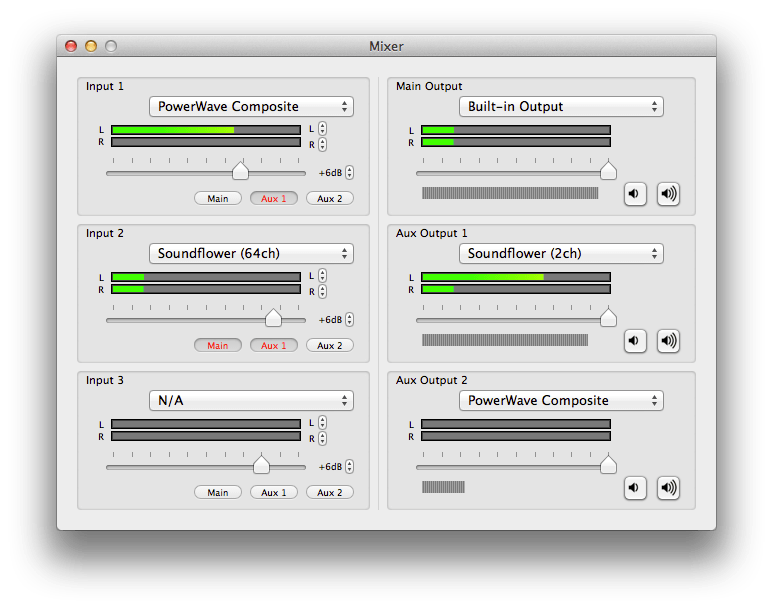 Soundflower is basically a sound routing bus that takes the arbitrary channels and mixes them down to a single 2 channel signal. Although the 64 channel is the input and the 2 channel is the output, you do the reverse because you want your system audio feeding Soundflower’s input and Soundflower’s output feeding your system input. Again, just trust me. Next, you will open Ladiocast. This program gives you the option of taking up to three inputs and sending them to up to three outputs. It seems like Soundflower and this program are doing the same thing but they are not, they are complementary players in this game. I’ve got a screen capture of my setup. The thing to note here is that my microphone is on “Powerwave Composite” (more about that later) and the computer audio is on the Soundflower bus. You can send each of the inputs (I’m only using two) to any of three outputs (also only using two.) I have my microphone going to Aux 1 and the computer sound going to Aux 1 and Main. Main is the headphone jack and is running to my hardware mixer. Stop for a breath. It gets more complicated from here. Let’s review where we are at so far. I have Soundflower configured as my system input and output, but I am also using Ladiocast to send my mic to only Soundflower and any further audio my computer plays (music, for example, or the audio coming out of the Hangout) to both the headphone jack and Soundflower. Now we are going to talk about my mixer setup. This is the other half of the configuration, and what fulfills the rest of my requirements. As you look at the mixer, input 1 is trusty studio mike. Input 2 is my lavalier mike. Input 3/4 is the output from the computer’s headphone jack. On the right is the mixer output which is going directly into my Marantz PMD 670 (the mixer is sitting on top of it.) At the top, the patch cable running from the adapter is going to the Griffin PowerWave which is then goes back to the computer via USB. (This laptop doesn’t have a line-in jack, so if I had that I wouldn’t need it.) They don’t seem to make them anymore, but a Griffin iMic would do the same function. Lastly are the headphones plugged into the top right jack. Now, the PowerWave works solely to get the signal from my microphone into the computer. I have the FX return going to it, so I turn that up (third row of dials from the bottom) on any input I want to go back to the computer (in my set up, only the active microphone.) Conversely, the main mix (bottom row of dials) controls what goes into my Marantz recorder. What I am monitoring with the headphones is this. I turn up my mike in this, as well as the computer output and send the whole mix to the recorder. This is my local copy. In order to close this loop, when you start your Google Hangout or equivalent, set your audio source to be Soundflower 2ch. At this point, the full monty has been achieved. With all this done, I have fulfilled my requirements. I have a single microphone that is recording me for both the local recording and is also going back to the people in the Hangout. I am recording my own audio locally for the whole session. If I play computer audio, it routes it back to the other participants in the Hangout but also plays into my local copy. The other participants in the Hangout are recorded in my local copy. Life is sweet! It seems pretty complicated but for my use case, this is as simple as it can get. With a physical line-in jack the PowerWave can disappear. If I were recording the microphone on a USB headset, it would be a lot simpler. In that case, I would set that as my Input 1 in Ladiocast and send it to both Main and Aux 1, and could send the line-out directly to a recorder and not even need the physical mixer. This is a starting point, most people will need to fiddle a bit to get things working. The key parts are getting the Soundflower inputs and outputs set up correctly or you hear nothing anywhere, and using Ladiocast. For a program this remarkably useful, it is shocking I had never heard of it before. Let me know how this works for you. Leave a comment if it worked or it didn’t, and we’ll see what can be done.